Have you detected strange noises on your phone line? Or found a camera hidden in the plant pot on your desk? If the answer is yes, then you may be in need of bug sweep detection services for your office. But, what exactly do you need and how do you find it? When searching for counter surveillance services, you need to check that the companies you approach have experience in your business sector. Not only will this aid them in knowing what to look for, but it will also mean that they can give you more accurate advice on dealing with the potential threat. You will also need a bug sweep service that is flexible and able to work around your needs. If it is important that clients are kept unaware of the potential problem, then you may need them to come in covertly, or to do the sweep at night. Similarly, you will also want a service that can respond fast. The longer you go without knowing where the bugs are, the more risk there is of someone giving important information away. The right service for your office will be able to work with a range of detection methods to ensure that nothing is left to chance. They will look for visual, as well as auditory bugging devices, and in agreement with you will check the surrounding area, not just the limits of your office. This might include areas you share with other businesses, such as lifts, hallways and bathrooms. A company that can provide all of this and more, is Advanced Sweeping. Our experienced staff offer bug sweep detection services that are tailored to meet your company’s needs. Our pricing is realistic and affordable, and we are always available on short notice. 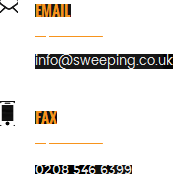 Leave your details on our contact page at http://sweeping.co.uk/ and we will get back to you as soon as possible.